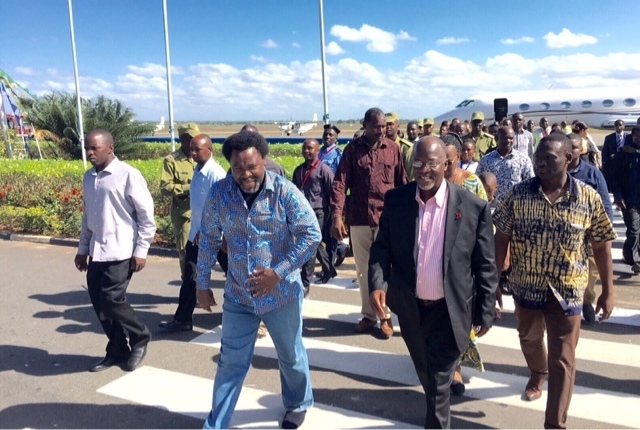 The renowned Nigerian evangelical preacher, T.B Joshua is in the country to witness the inauguration of Dr John Pombe Magufuli as Tanzania’s next President. Joshua who flew into the country yesterday by private jet complete with an entourage of about 40 people was received by the President-elect at the Dar es Salaam International. The preacher was also able to pay a courtesy call to President Jakaya Kikwete at State house. During perhaps the most hotly fought Presidential contest in Tanzania’s history, pictures first emerged on social media of Ukawa presidential candidate Edward Lowassa with his wife apparently seated on the front row in Joshua’s Church of All Nations in Nigeria. These came at a time when some had been questioning the Ukawa candidate’s health. Almost immediately, pictures showing then CCM Presidential candidate, John Magufuli with his wife and son in a close picture with the preacher who many believe can turn around fortunes. It is however not clear if his coming to attend Magufuli’s innauguaration as President outs the fact that despite the two fierce competitors having been to “see” him, he “knew” the chosen one to be Magufuli. T.B Joshua whose Emmanuel TV broadcasts to many countries including Tanzania has previously been linked to several prophesies which are said to have come true, including the disappearance of Malaysian Airline MH370.